He was born in 1933 in the tiny community of Nøss in the south-western part of Andøya. His dream of a career in art was not mentioned aloud there at the time, nor for several decades thereafter. Fortunately there were ample houses with walls that needed a coat of paint on the western side of this exposed Arctic island. So he did indeed become a painter. Headhunting was uncommon among young painter-craftsmen at the time. It may well be uncommon still today, but with his experience as a painter of weather beaten walls exposed to westerly winds, Gunnar Tollefsen easily found a job as a painter in Oslo. But this time, his brushes covered different surfaces. As fortune would have it, he was granted admission to the Norwegian National Academy of Fine Arts under the tutorship of Åge Storstein and Reidar Aulie. Having returned to Vesterålen, he contributed towards doubling the number of persons in the region with an education in the arts. The other one was a musician. They joined forces in Sortland Municipality. In the village of Maurnes, no less. This saved him one less ferry ride on his way back to his home village of Nøss. This man who years ago chose a profession so foreign and so little revered in his place of birth has now surrounded himself with a family comprising a wife and two children, all of whom are artists. All of them live and work either permanently or periodically in the studio on the family farm by the western seashore of the island. Thanks to the Grand Old Man of the family, visual art has become the most prevalent vocation in the village. 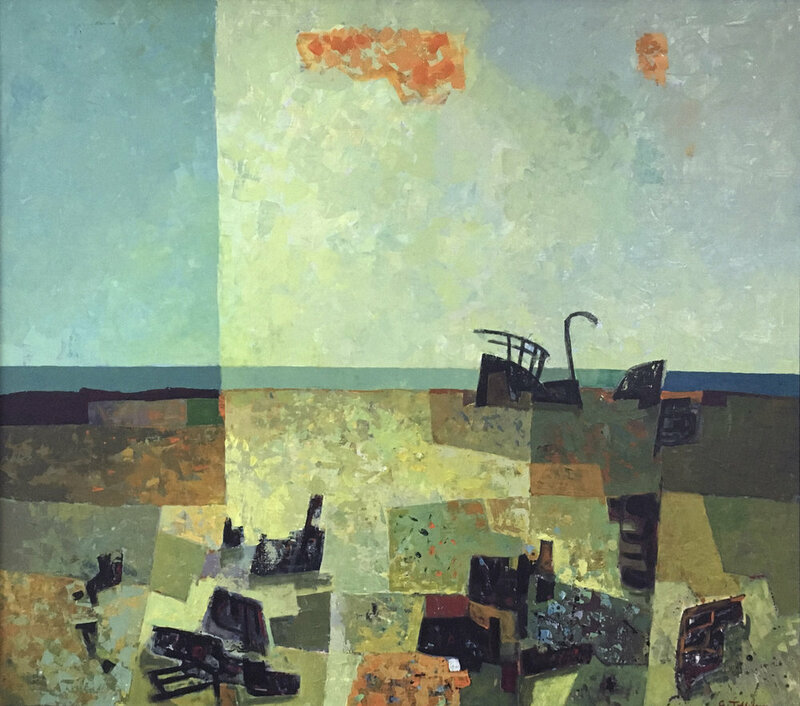 During his life as an artist, Gunnar Tollefsen has been committed to developing and refining the cubism and abstract art with which he began his career at the academy. At the time, he would pretend he had a “real job” and kept his work as an artist under his hat. As a result, there are few people who have noticed this taciturn modernist from Nøss. At Gunnar’s childhood home at Nøss/Andøy, the Tollefsen family of artists have established a gallery and several studios with a view of the horizon. Gunnar Tollefsen’s art brightens the façade of the Radisson Blu Hotel at the intersection of Moloveien and Hålogalandsgata. Gunnar Tollefsens shows two of his latest paintings at the group exhibition NorlandiART-18, which are for sale through our web gallery.